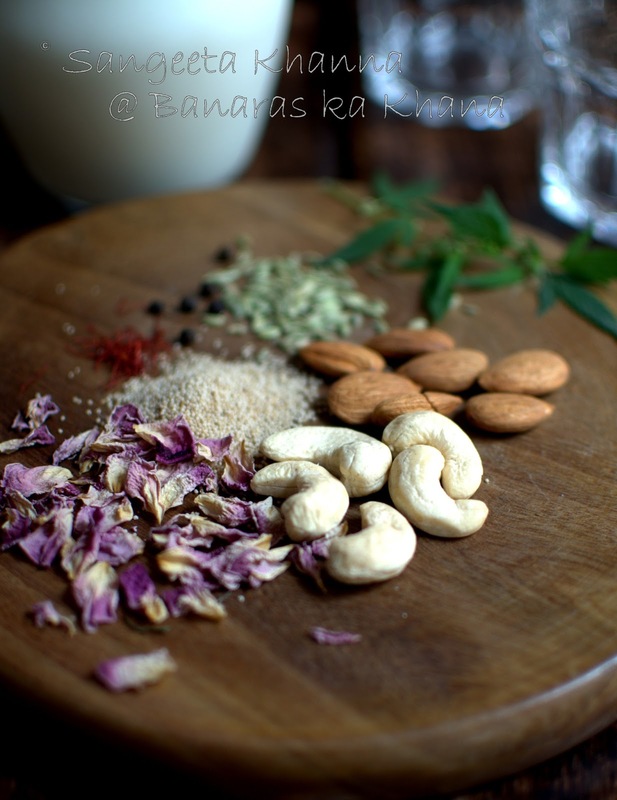 Homemade thandai and easy? Yes. It takes just under 5 minutes to soak the ingredients and then another 10 minutes to make a paste after the soaking time. A concentrate of thandai is ready to be refrigerated and used as required. Add milk and enjoy thandai any time you like. You must have come across Haldiram's Thandai or Mishrambu that is manufactured in Banaras. These bottles of thandai concentrate fly off the shelves of supermarkets and small shops alike during holi season. Thandai is a cooling drink to be enjoyed all over summer, but holi is the time when we start having thandai officially. I had been planning to post a thandai for very long. Last year I made thandai after holi, took pictures too but that couldn't come to the blog. This time I thought let's treat you with this refreshing aromatic drink for the festival of holi. The bhang plant grows in my garden, it self seeds every year and I use it whenever required. 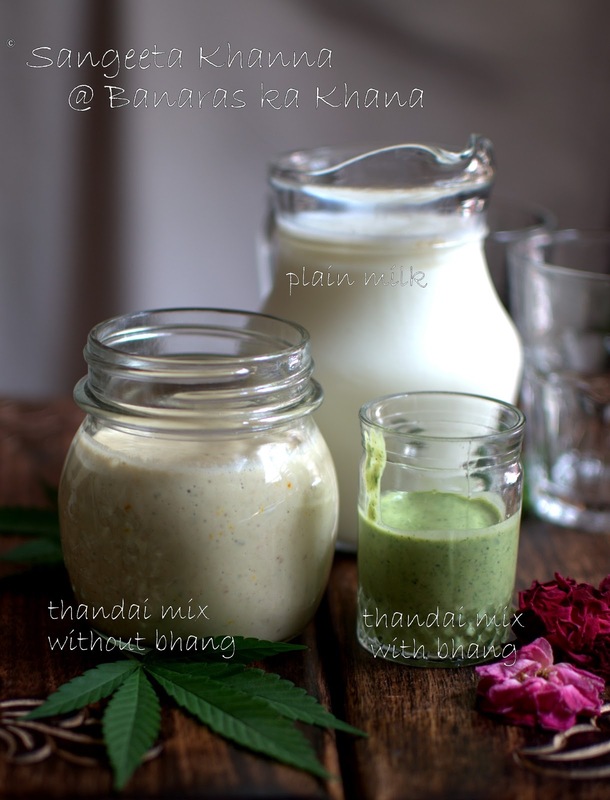 For bhang waali thandai, there is nothing better than freshly plucked bhang (Cannabis leaves). Though nicely dried leaves are very aromatic as well. Use dried leaves if you want. 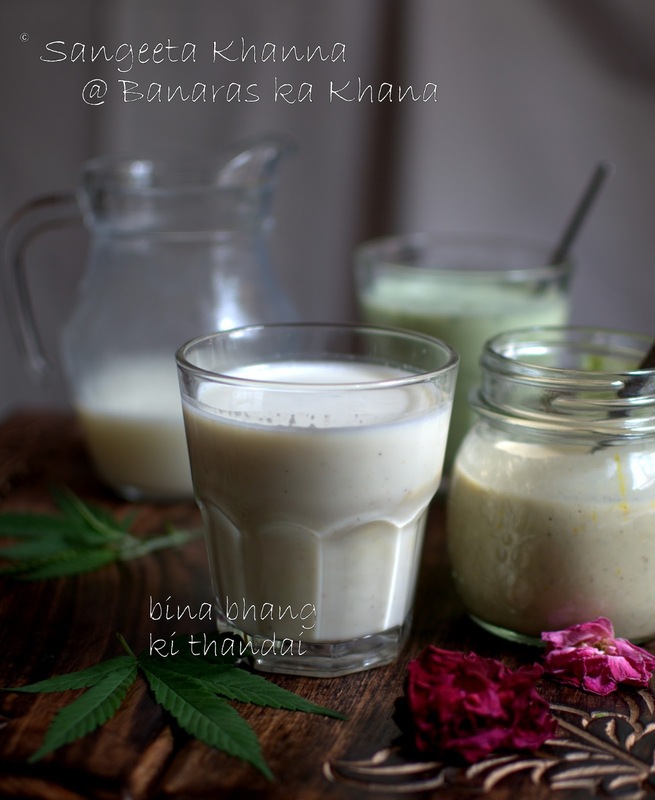 Since I have some fresh bhang (cannabis leaves) growing in my garden, I used that too to make a bhang waali thandai, used 10 leaves to make 2 glasses of the green bhang waali thandai. 9-10 glasses of chilled full fat milk will be required to dilute the concentrate to make fresh chilled thandai. 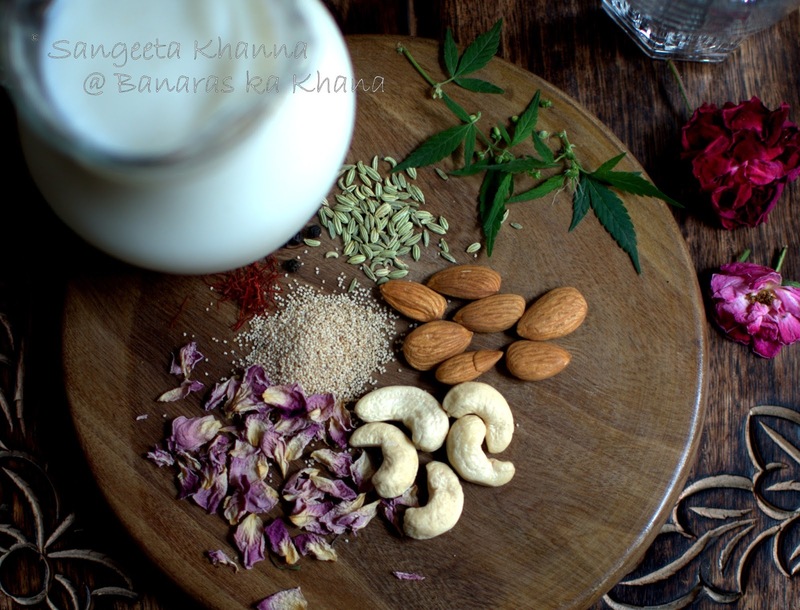 Soak all ingredients except milk and bhang leaves in about a cup of water or to submerge them all well. A minimum 2 hours of soaking will be good. Blend in your mixie or food processor to make a smooth paste. Add the sugar too while blending the mixture. Empty in a jar with lid as this is the concentrate to be refrigerated. If making fresh thandai for immediate use, dilute with chilled milk, blend again if you want it frothy and serve. 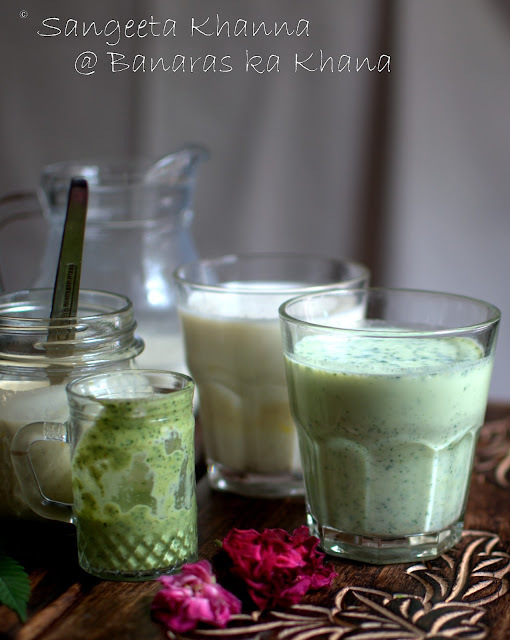 Otherwise, take 2-3 tbsp of the concentrate, dilute with chilled milk to make a glass of thandai and serve. To the same concentrate mix of thandai, add bhang leaves as required and blend again. Refrigerate or dilute immediately to make bhaang waali thandai. The regular thandai is also called kesaria thandai due to the use of saffron in it. If the kesaria thandai doesn't look enough yellow (kesari), don't worry. The blended saffron threads keep releasing color into the concentrate mix and make it quite yellow the next day..see how it releases color after just 5 minutes of blending..Adjust sweetening as per taste. Bhang waali thandai has a very aromatic flavor of bhang, something relished by those who love it. 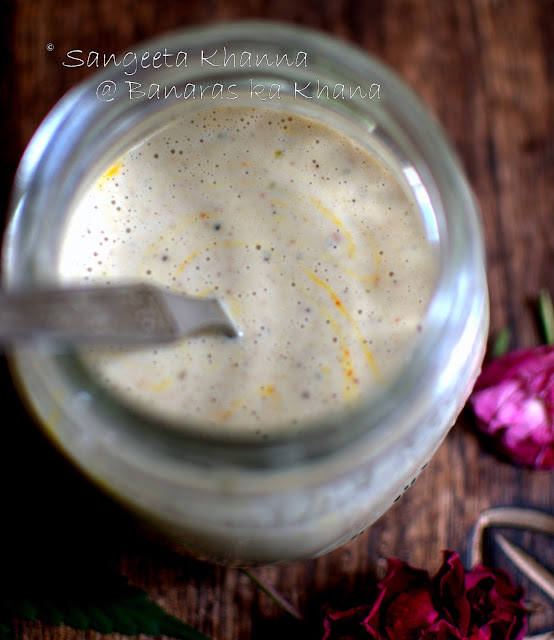 The Kesaria thandai has a prominent flavor of saffron, fennel and a mild hint of peppercorns. Richly nutty of course. The amazing thing is, these hot peppercorns are cooling in nature when ground with water and taken with cold milk. The other ingredients are all cooling in nature as well. Now you realise how easy it is to make thandai at home. It doesn't take much time or effort as well. Happy holi to you all and please do let me know whenever you try this recipe. I want - Iwant.. This is sheer torture.... What if one does not have rose petals? Any substitute for that? Wishing you both a very Happy Holi!! Lol.. Only this was left to try! I guess milk will spoil if you use vodka.